Doctors and pharmacists give them out for everything from undiagnosed to mild infections. Farmers across the globe sprinkle them in their animal feed. They’re floating in the water and buried in the soil. They’re antibiotic-resistant bacteria — and they have outsmarted us. 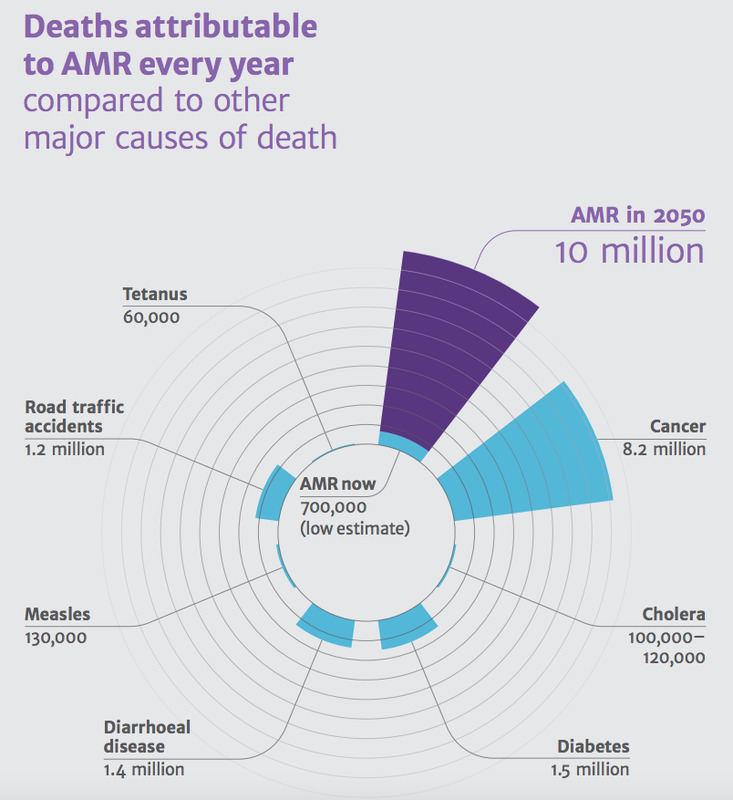 Antibiotic-resistant infections — those that no longer respond to the drugs we use to overpower them — are killing 700,000 people each year, according to a new report from the Healthcare Infection Society. That number is set to grow exponentially in coming years, so long as our fervent overuse of antibiotics continues to climb. Doctors commonly treat bacterial infections with antibiotics. When one drug doesn’t work, they try another. These techniques are dangerous because the bacteria that can resist the antibiotic are more likely to survive it and pass on their resistance genes. Over time, the bacteria evolve, becoming more and more resistant to our drugs. As a result, some of our infections are resistant to even our strongest antibiotics. It’s a scary scenario, but it’s already beginning to take shape. Between 2000 and 2010, international sales of antibiotics for human use shot up 40%, the report found, with Brazil, Russia, India, China, and South Africa making up three-quarters of that increase. But these countries aren’t acting alone. In the US, as many as half of antibiotic prescriptions are unnecessary. American farmers continue to overuse them in pigs, cattle, and chickens, creating stronger, more resistant bacterial strains. The problem is worsening quickly. If our behaviour doesn’t change, it could take humanity about a century back in time in terms of deaths from infections. “Antimicrobial resistance threatens many of the most important medical advances we have made,” the authors of the report write.